Ear acupuncture is a type of acupuncture that involves inserting needles into specific points on the ear. Stimulating these points is thought to promote healing in other areas of the body. Also referred to as auricular therapy or auriculo-acupuncture, ear acupuncture is often incorporated into standard acupuncture treatments. Although ear acupuncture is largely based on the principles of traditional Chinese medicine (a form of alternative medicine that originated in China), it was developed in the mid-20th century by French scientist Paul Nogier. Ear acupuncture is used to improve the body's flow of vital energy (also known as chi or qi) and to restore a balance between yin and yang (two opposing but complementary energies) within the internal organs. In traditional Chinese medicine, each of these effects is considered essential in treating disease and achieving health. In addition, ear acupuncture is sometimes used to enhance mood, aid in smoking cessation, alleviate pain, promote sounder sleep, relieve stress, and support weight loss. Although large-scale clinical trials on ear acupuncture are currently lacking, a number of studies suggest that this therapy may aid in the treatment of a variety of health conditions. Here's a look at several findings on ear acupuncture and its potential health benefits. Several studies indicate that ear acupuncture may help ease insomnia. These studies include a 2003 trial published in Complementary Therapies in Medicine, which tested the effects of a form of ear acupuncture that involves using magnetic pearls to stimulate acupuncture points. For the study, 15 elderly people with insomnia were treated with ear acupuncture for three weeks. Results revealed that participants experienced a significant increase in both the quality and quantity of sleep, with improvements lasting for six months after treatment ended. So far, research on ear acupuncture's effectiveness as a smoking cessation aid has yielded mixed results. In a 2004 study published in the Swiss Journal of Research in Complementary and Natural Classical Medicine, for instance, a survey of 126 people who had undergone ear acupuncture for smoking cessation found that the treatment had a one-year success rate of 41.1%. 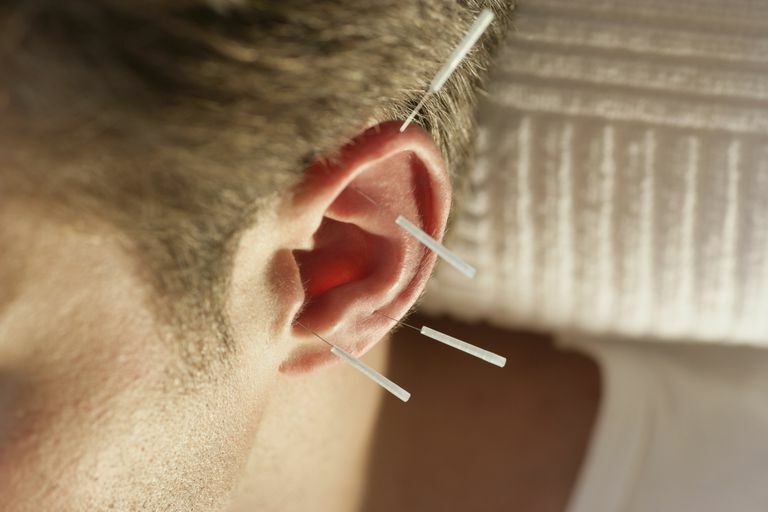 According to the study's authors, this success rate makes ear acupuncture "a competitive alternative to orthodox medicine withdrawal methods." In a study published in the Journal of the American Board of Family Medicine, however, a trial involving 125 people found that ear acupuncture was no more effective than placebo treatment in improving the rate of smoking cessation. The study involved five consecutive weeks of once-a-week treatments. Ear acupuncture may be useful in the treatment of migraines, according to a study published in Acupuncture & Electro-Therapeutics Research in 2012. Analyzing findings on 35 migraine patients, the study's authors determined that two months of weekly ear acupuncture treatments led to significant improvements in pain and mood. For a report published in the Journal of Alternative and Complementary Medicine in 2010, investigators sized up 17 studies on ear acupuncture's effectiveness in pain management. The report's authors concluded that ear acupuncture may be effective for the treatment of a variety of types of pain, especially postoperative pain. A research review published in the Journal of Alternative and Complementary Medicine in 2010 suggests that ear acupuncture may aid in the treatment of constipation. For the review, researchers examined 29 studies on the use of ear acupuncture in constipation management. Although all of the studies reported that ear acupuncture was effective in treating constipation, the review's authors note that due to major flaws in the reviewed studies, more research is needed to confirm these findings. If you're considering trying ear acupuncture, make sure to consult your physician first. Self-treating and avoiding or delaying standard care can have serious consequences. Asher GN, Jonas DE, Coeytaux RR, Reilly AC, Loh YL, Motsinger-Reif AA, Winham SJ. "Auriculotherapy for pain management: a systematic review and meta-analysis of randomized controlled trials." J Altern Complement Med. 2010 Oct;16(10):1097-108. Ausfeld-Hafter B, Marti F, Hoffmann S. "Smoking cessation with ear acupuncture. Descriptive study on patients after a smoking cessation treatment with ear acupuncture." Forsch Komplementarmed Klass Naturheilkd. 2004 Feb;11(1):8-13. Ceccherelli F, Lovato A, Piana E, Gagliardi G, Roveri A. "Somatic acupuncture versus ear acupuncture in migraine therapy: a randomized, controlled, blind study." Acupunct Electrother Res. 2012;37(4):277-93. Fritz DJ, Carney RM, Steinmeyer B, Ditson G, Hill N, Zee-Cheng J. "The efficacy of auriculotherapy for smoking cessation: a randomized, placebo-controlled trial." J Am Board Fam Med. 2013 Jan-Feb;26(1):61-70. Li MK, Lee TF, Suen KP. "A review on the complementary effects of auriculotherapy in managing constipation." J Altern Complement Med. 2010 Apr;16(4):435-47. doi: 10.1089/acm.2009.0348. Suen LK, Wong TK, Leung AW. "Effectiveness of auricular therapy on sleep promotion in the elderly." Am J Chin Med. 2002;30(4):429-49. Suen LK, Wong TK, Leung AW. "Is there a place for auricular therapy in the realm of nursing?" Complement Ther Nurs Midwifery. 2001 Aug;7(3):132-9. Suen LK, Wong TK, Leung AW, Ip WC. "The long-term effects of auricular therapy using magnetic pearls on elderly with insomnia." Complement Ther Med. 2003 Jun;11(2):85-92.